« The Spookiest Time of the Year – Heroes Square Budapest – 2017. Andrea Bocelli is coming to Budapest 2017. Saturday, 8 p.m. – November, 25. 2017. Andrea Bocelli is an Italian classical crossover tenor, recording artist, and singer-songwriter. Bocelli has recorded fifteen solo studio albums, of both pop and classical music, three greatest hits albums, and nine complete operas, selling over 80 million records worldwide. He has had success as a crossover performer bringing classical music to the top of international pop charts. Andrea Bocelli has been known for over twenty years as one of the most beloved and world-famous stars. 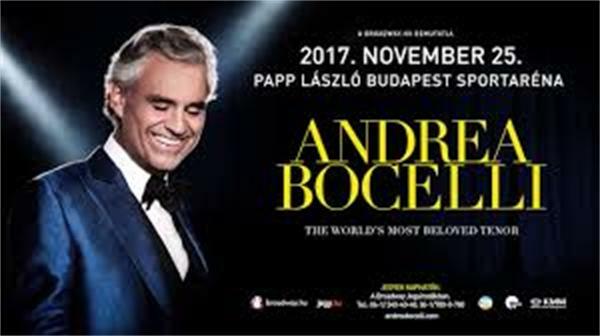 After two years, the popular tenor returns to Papp László Budapest Sport Arena , where can hear his unique voice again at a truly special concert.